Getting custom designed PBIS posters, banners and signs from Mascot Junction is a great way to expedite your launch and get enthusiastic buy-in from students and staff. Each poster, banner and sign is customized with your words, your theme/acronym, your colors and your mascot. Illustrations of your mascot are used to visually demonstrate the nebulous concepts often taught in PBIS and character trait education programs. The pictures make the concepts easier to grasp and self-relatable because they feature YOUR mascot. It’s a very engaging way to promote your school’s program. Learn more about PBIS Roll Out Kits and custom PBIS Posters at mascotjunction.com. 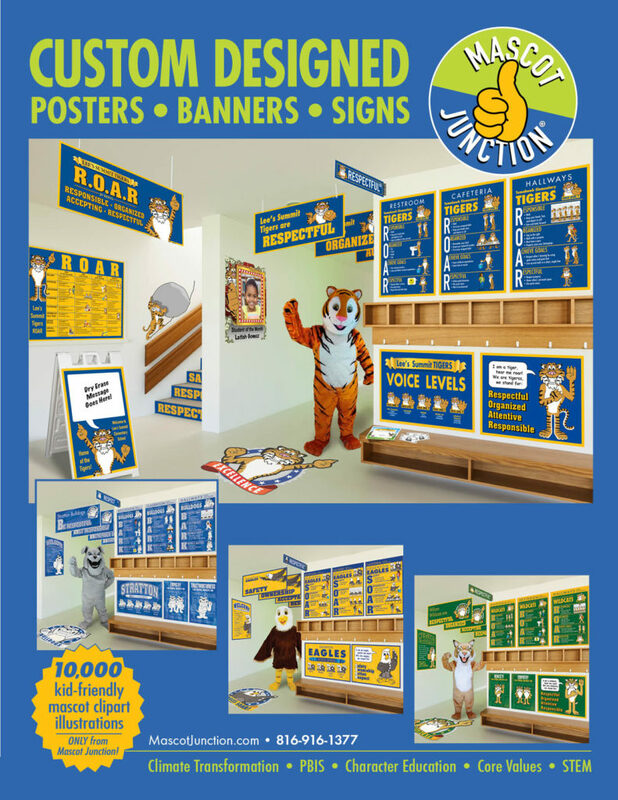 See all the new PBIS posters, banners signs and graphics from Mascot Junction in our new full line catalog. All graphics are customized with your words, your acronym, your colors and your mascot. Whether your school has a PBIS program or teaches character traits and core values, Mascot Junction can help make your program more fun, engaging and effective. Learn more about PBIS Roll Out Kits at mascotjunction.com. 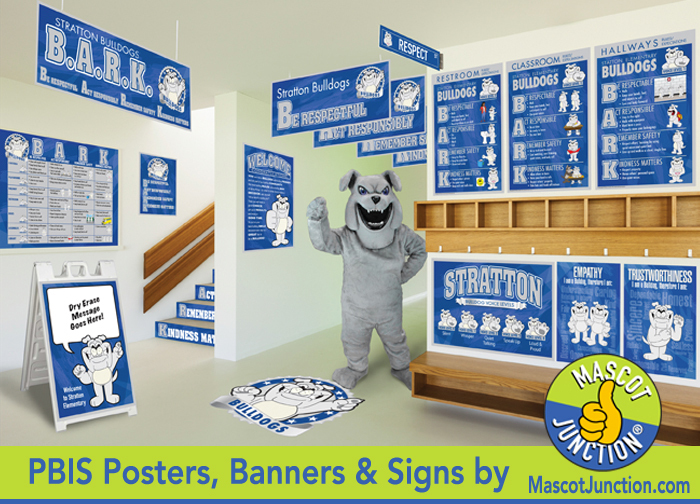 See all the new posters, banners and signs from Mascot Junction to support your school’s PBIS or Character Education program. The 2019 catalog is online right now, and features exciting new products like Word Cloud Posters, Feel Good Posters, Hanging Ceiling Signs and more! Bring your PBIS program to life with posters, banners and signs that are customized for your school. Send Mascot Junction your matrix, and we’ll design and print PBIS rules posters for the different areas of your school, along with a full matrix, acronym/theme banners and other items to help you create an engaging school climate around your PBIS program. PBIS posters, banners and signs are custom designed for each school and feature a kid-friendly version of their mascot. The sample shows features our bulldog mascot, but we also have more than 135 other kid-friendly mascots. See if you can find yours at MascotJunction.com. The kid-friendly mascots are designed for elementary and middle schools. We also have cool/edgy graphic logos for high schools, with older students. Each mascot has clip art sets featuring more than 80 illustrations of the mascot doing activities related to school, sports, holidays, positive behavior and character traits. Be Respectful, Be Responsible, Be Safe is a common theme for many PBIS schools. Mascot Junction designs custom posters for schools around their PBIS theme. Common PBIS themes include SOAR, ROAR, PAWS, PRIDE and Be Respectful, Be Responsible, Be Safe. 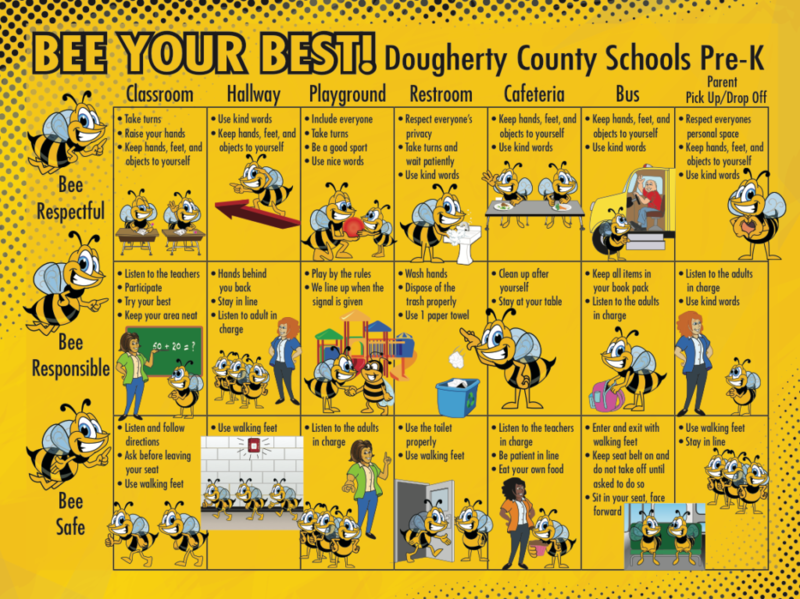 This poster features a cartoon bee character, however Mascot Junction can also design posters that feature your school mascot as the role model, demonstrating each positive behavior. Mascot Junction has more than 120 kid-friendly mascots and more than 80 illustrations of each one for designing posters and banners like this. Overall, there are more than 10,000 illustrations in the Mascot Junction clip art library. Be Responsible, Be Respectful, Be Safe are brought to life with Mascot Junction’s cartoon bee character. Introducing a new design style of PBIS Rules Posters from Mascot Junction. 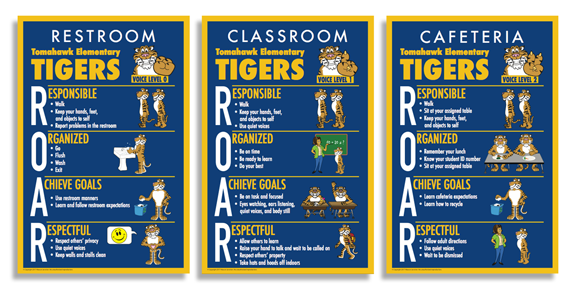 Each poster is designed to make the most of the acronym (ROAR, SOAR, PRIDE, etc. 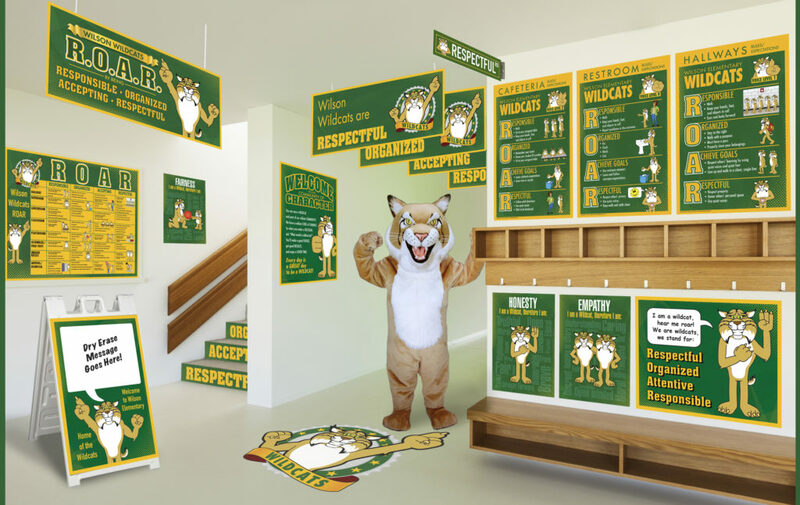 ), and features the school mascot demonstrating the positive behaviors for each area of the school. Each poster is customized with your words/rules, your mascot and your colors. Ask for Rule Poster Design Style 3, when filling out your Planning Guide. Click here for a Catalog, Price List and Planning Guide. 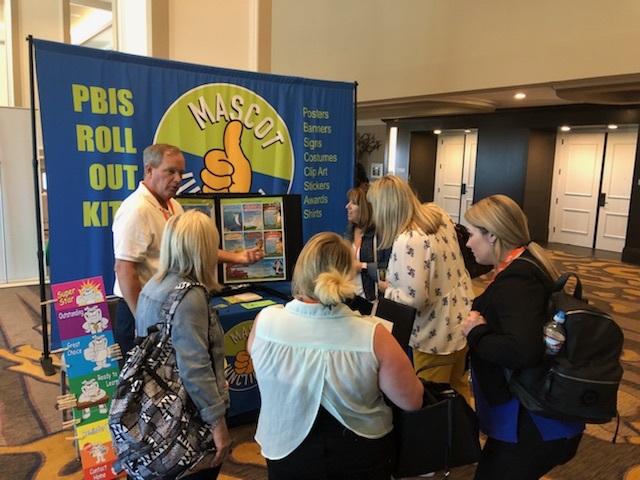 PBIS poster and banner design was the topic of discussion at the Mascot Junction booth at this year’s APBS Conference in San Diego. Mascot Junction has more than 100 kid-friendly mascots, and each comes in their own clip art sets, featuring more than 80 illustrations. These illustrations are used to bring the nebulous topics of respect, responsibility, safety and others into clear focus, using a mascot that the child self identifies with. Clip Charts for reinforcing positive behavior in schools are printed on durable 1/8 thick PVC plastic, and are 10″ wide by 42″ tall. The “Ready to Learn” section is large enough to accommodate 36 clips, or clothes pins, making it large enough to serve the largest classrooms. The “up-clipping” areas are also larger, so you can celebrate demonstrations of positive behavior with a larger number of students. “Down-clipping” areas are smaller for similar reasons. 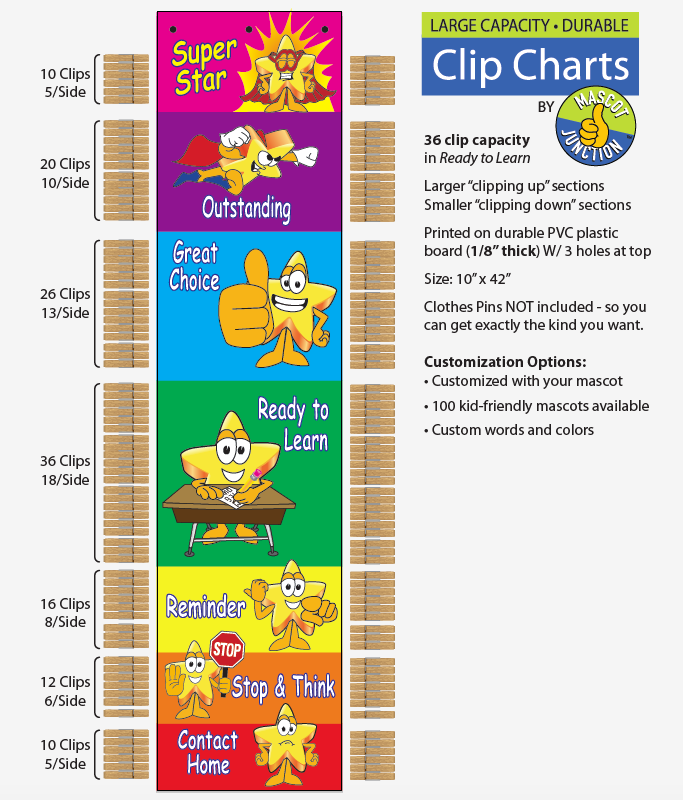 Mascot Junction customizes Clip Charts for each school with the school mascot. We have more than 100 kid-friendly mascots to choose from, and if we don’t have one you like, we’re glad to create one for you, or work with one you provide. By using your school mascot, you integrate the clip charts into the rest of your school’s culture, which to a large degree, centers around the mascot. 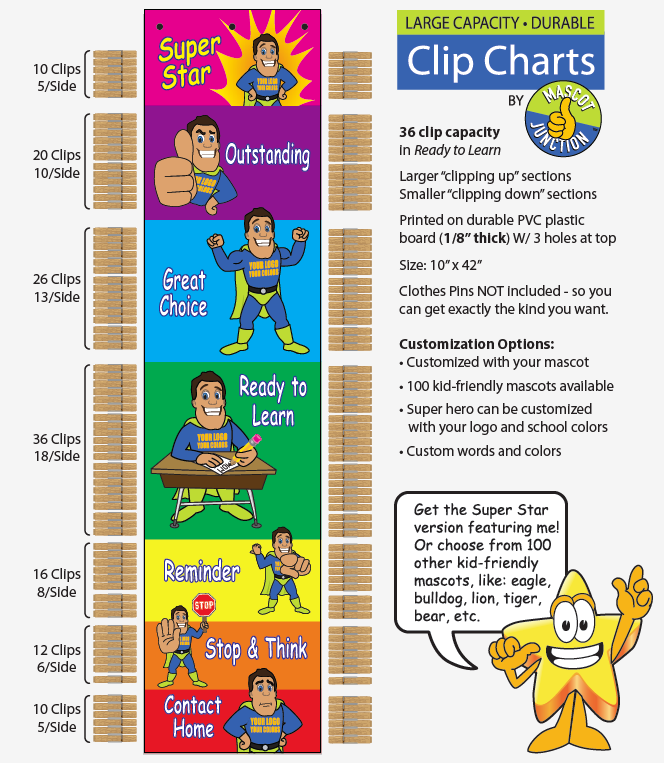 In the sample provided, the clip chart features a super hero. We can customize the hero’s costume with your school colors, and put your school logo, or initials on his chest. We’re also pleased to offer a generic super hero version and a super star version – both require no customization so we can print and ship those real quick for you. Our new owl mascot has 80 illustrations in both of its clip art sets. Learn more at mascotjunction.com. 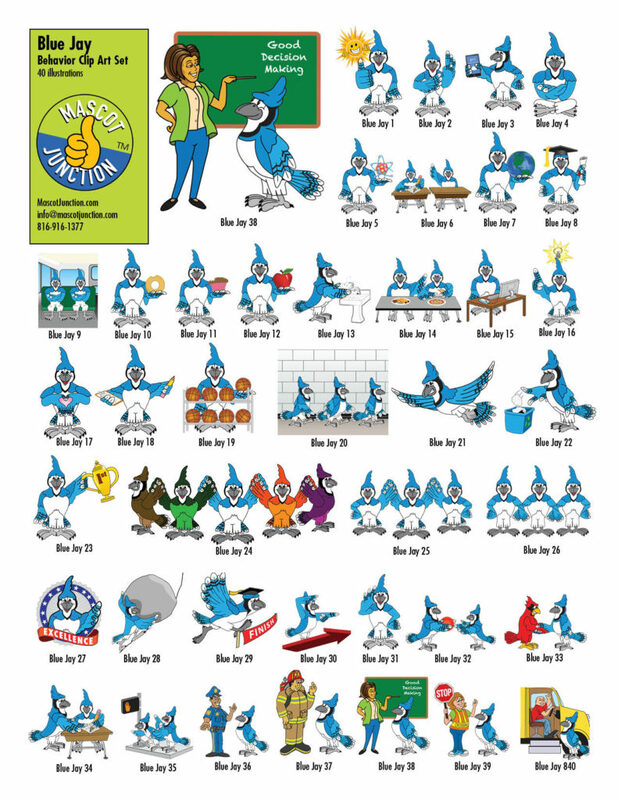 The behavior clip art set of the owl mascot features 40 illustrations of the owl demonstrating positive behavior for schools with PBIS programs. We also have a 40 pose standard clip art set featuring the owl doing activities related to school life, holidays and sports. Use the clip art for posters, banners, bulletins and other school communications to teach positive behavior. PBIS Posters For Restroom, Hallway, Cafeteria, etc. PBIS Rules Posters are customized with YOUR rules, YOUR PBIS theme, YOUR school colors and feature YOUR school mascot visually demonstrating the positive behavior expectations of your PBIS program. 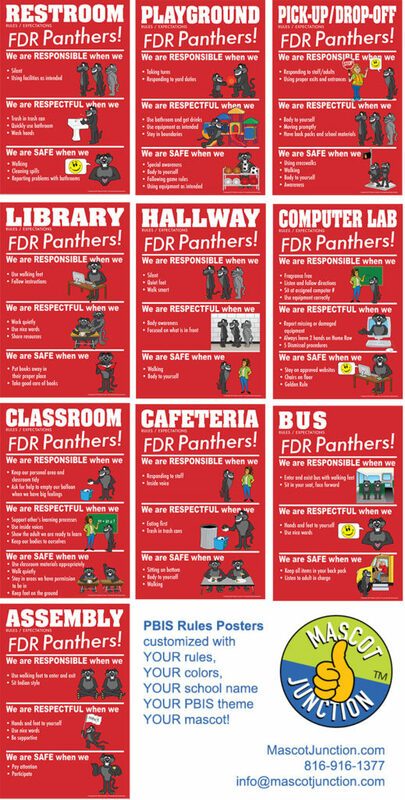 These posters feature our kid-friendly panther mascot, but we also have more than 100 other kid-friendly mascots, so no matter what your school mascot is, we can help you use it to teach positive behavior and make your PBIS program more fun and engaging. Rules posters are often used for the restroom, hallway, cafeteria, classroom, playground, assemblies, pick-up and drop-off area, library, computer lab and bus. Learn more at MascotJunction.com. These PBIS rules posters feature a panther mascot visually demonstrating positive behaviors in different parts of the school.